Different preparation techniques and procedures are often needed to produce a substrate that is acceptable and ready for the installation of various flooring products. The design and condition of the subfloor has a direct influence on the installation and performance of a floorcovering, so the importance of subfloor preparation cannot be emphasised enough. The subfloor must be sound and strong enough to support the flooring product under the conditions for which the floor has been designed. Old floorcoverings such as flexible vinyl, linoleum, rubber and textile floorcoverings must be removed and the substrate thoroughly prepared to render it clean and free of contaminant before fully bonded floorcoverings can be laid. Existing floorcoverings can be mechanically removed using a process called Multistripping whereby a blade or pick is attached to the front of the machine, which cuts into/lifts under the surface finish to be removed. Typical applications are removal of vinyl, rubber, carpets, fully bonded wood flooring, ceramic, stone and terrazzo tiles. These machines are generally best suited for soft floor coverings, provided that the underlying substrate is perfectly smooth, and integrally sound. The condition of the subfloor must be thoroughly evaluated and all necessary treatments or repairs carried out before beginning the final treatment to bring the surface up to the industry standard required for the successful application of floorcoverings. Failure to identify underlying problems and suitably prepare the subfloor, increases the potential for failure, which is costly and time-consuming. If the substrate is questionable, the contractor or specifier should exercise caution and advise the client of the risks involved before proceeding with installation. What constitutes a questionable subfloor? Old or new substrates contaminated with oil, grease, fat or chemicals or other deposits, weak or friable screeds, toppings or concrete slabs, floors with large cracks or structural damage are not satisfactory surfaces for the application of most flooring products. The base substrate and floor finish should be designed to withstand all structural, thermal and mechanical loads that will occur during the floor’s lifespan. The structure and subfloor need to remain stable and must include all expansion, construction and saw cut joints if necessary, when designing the system. In extreme cases, the condition of the presented substrate and the normal preparation techniques will not correct the surface profile or render the substrate suitable to receive the floorcovering. In these cases, the only remedy is to uplift and relay the complete subfloor. Besides being a contributing factor which can cause failure, structural cracks, unevenness and faults in the underlying substrate may be reflected through the surface finish and floorcoverings, which will impact on the integrity and aesthetics of the installation. During the laying of the floorcovering, an ambient temperature of at least 18°C must be maintained along with a floor temperature of at least 10°C. All materials being installed should be allowed to acclimatise on site for no less than 24hrs before installation commences. Setting out is also important and resilient floor coverings should be relaxed and in position before final fixing takes place. 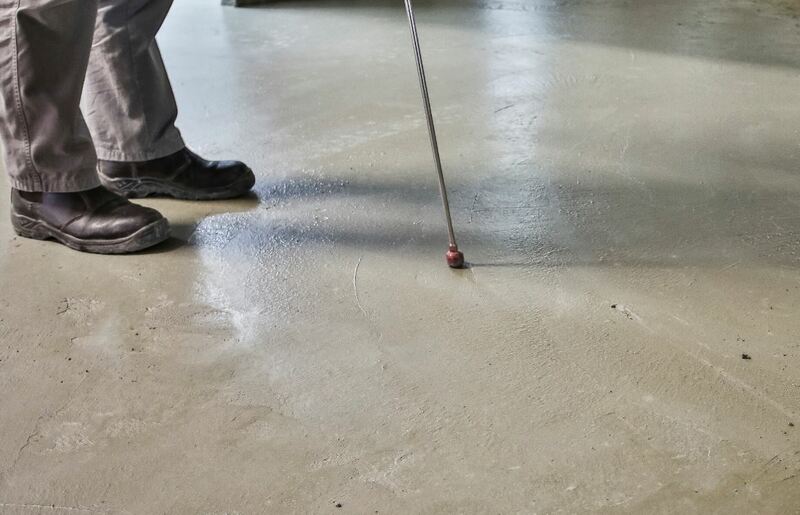 The most commonly used methods of surface preparation for concrete or screeded floors are scarifying, grinding, mechanical abrading, and vacuum recovered shot blasting. Floors vary in their uses whilst floor finishes and preparation materials require different surface profiles before application of a system. It is for this reason that each method should be judged on its merits as well as the working environment in which the preparation has to take place. For example, planing may be a perfectly suitable method for preparing a floor in an unoccupied site. However, the resulting dust and noise may preclude it in many other situations. A flooring or suitable specialist should be consulted regarding the appropriate method. Densifiers and/or surface sealers frequently interfere with adhesion and must therefore be removed using one of the methods mentioned above. All old adhesive residue should also be removed by mechanical methods such as scraping, shot blasting or diamond grinding etc. The subfloor must be free of laitance and surface contamination. Moisture levels have to be below 75% Relative Humidity (RH), 3% total moisture by gravametric, carbide bomb or speed test method (less than 65% RH for wood floors) before proceeding with the installation. If you have a concrete or sand/cement screed topping, time should be allowed for the construction moisture to dry out before the floorcoverings are installed An appropriate waterproof surface membrane, or vapour barrier should be used if there isn’t enough time for the screed to dry out naturally, or if the base RH reading is greater than 75% RH (65% RH for wood floors). It is not advisable to proceed with the floorcovering before the floor meets the suppliers/ manufacturers stipulated pre-requisites for their material. The moisture content of a substrate may also fluctuate according to seasonal changes, changes in geographic surface run-off and structural changes in and around buildings. For this reason it is recommended that a vapour barrier be installed even if the floor appears to be dry at the time of the flooring installation. Prior to applying any coating, topping or adhesive, ensure that dust from any preparation method employed is removed by sweeping followed by vacuuming, ensuring that the dust is removed rather than redistributed. Preparing concrete may be a dusty operation, therefore appropriate PPE should be worn and good ventilation should be provided. Make adequate provisions to protect equipment, furniture and other items in the space. The recommendations in this article are general and modifications may be needed depending on the flooring system you are using and the service conditions under which the floor has to perform. If there is any doubt, seek further advice from technical experts, consultants and product manufacturers you trust. Specialised tip: Most floorcoverings such as flexible vinyl, linoleum, rubber and textile floorcoverings must be removed and the substrate thoroughly prepared before fully bonded floorcoverings can be laid. Full thanks and acknowledgement are given to www.f-ball.com, www.tal.co.za and www.polyflor.co.za for some of the information contained in this article. Main image courtesy of TAL.